Your iPhone is Wi-Fi enabled. Wi-Fi is typically the fastest wireless network you can use to surf the Web, send e-mail, and perform other Internet tricks on the iPhone. You use the Wi-Fi setting to determine which Wi-Fi networks are available to you and which one to use based on its signal. Check out your Wi-Fi options. A signal strength indicator can help you choose the network to connect to if more than one is listed; tap the appropriate Wi-Fi network when you’ve reached a decision. If a network is password-protected, you’ll see a lock icon. You can also turn the Ask to Join Networks setting on or off. 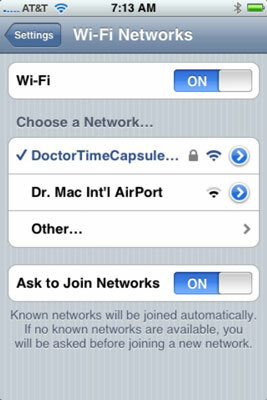 Networks that the iPhone is already familiar with are joined automatically, regardless of which you choose. If the Ask feature is on, you are asked before joining a new network. If it is off, you have to manually select a network.